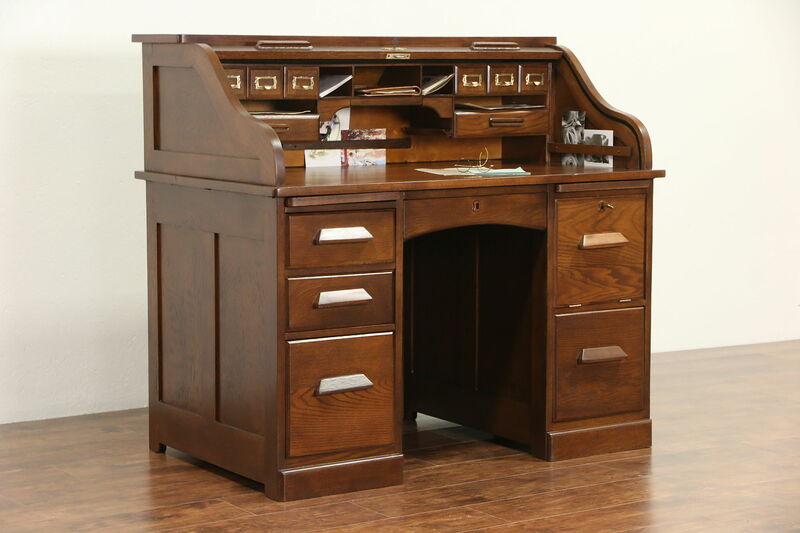 A classic "S" curve roll top desk from the very early 1900's has a locking file compartment. The roll top glides smoothly and has a working lock signed "Eagle." Inside are cubicles, drawers for papers, pen drawers plus pencil and note holders. There are two file drawers and two pull out shelves for extra work space. Deep drawers have dovetailed joints on this American made antique library or office furniture. Measurements are 48 1/2" wide, 30" deep, 44 1/2" tall and the desk top is 30" high, the knee hole is 18" wide and 25" high.